When you think about financial fraud, who do you think of first? Conman Bernie Madoff probably comes to mind due to the sheer scale and duration of the Ponzi scheme he perpetrated. If you’re over 50, maybe you think of Michael Milkin, who was convicted of felony charges for his involvement in the junk bond market back in the 1980s. While fraud on such a large scale is rare, fraud against investors is still quite common. In fact, thanks to the spectacular rise of cryptocurrencies in late 2017 and early 2018, ICOs (initial coin offerings) became a popular way to scam investors. Of course, ICOs have practically disappeared because the latest scams are always changing and evolving with the zeitgeist. That’s why it’s so important to stay on top of this important issue. To protect you and other investors, the team at Birch Gold Group has put together a comprehensive resource for protecting yourself against investment scams, cons, and rip-offs. Please know that our team is monitoring this guide and updating it as things change. So please bookmark this page and check back every few months for updates. If you prefer, you can subscribe to Birch Gold’s newsletter here to get notifications of new updates by email. This guide is designed to provide investors with the info necessary to identify fraudulent activity and common sense solutions to avoid being scammed. You’ve probably heard the phrase, “If it sounds too good to be true, it probably is.” While this is easy to acknowledge, it’s still a hard thing to remember when your “greed glands” are fired up. With that in mind, there are two very specific things to look for that truly are too good to be true. 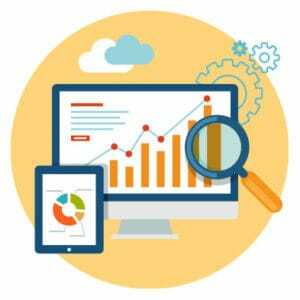 Guaranteed returns – Does the opportunity you’re looking at come with guaranteed returns? If it does, that’s a huge red flag because all investments carry a certain degree of risk — even low-risk bonds and treasury bills. 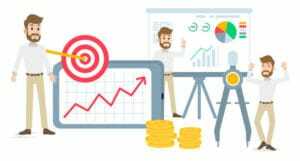 Overly consistent returns – A popular way to pitch fraudulent investments is to show a track record of overly consistent returns with only one or two very small losses. The losses are red herrings to trick you into believing the investment is legitimate. Ultimately, it’s important to trust your gut. If something sounds like a “can’t lose” investment, and your internal alarms start going off, pay attention to them and back out of the deal. 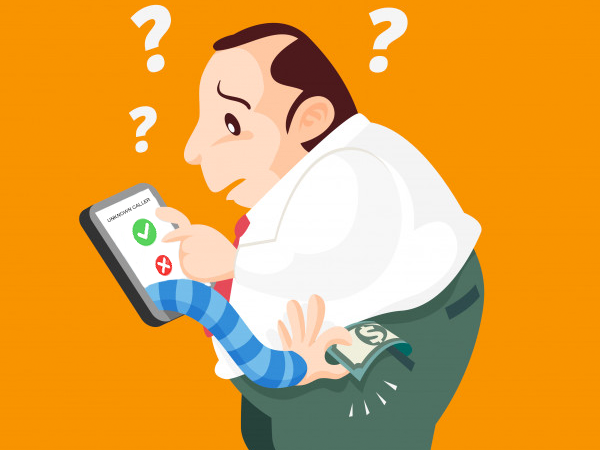 The person tries to scare you into taking immediate action or sending money ASAP. Scammers like to use unreasonably short deadlines after which they claim their offer will no longer be available. The implication is that you must pay money today, otherwise the offer will be gone tomorrow. But genuine opportunities do not use such high-pressure tactics. They will still be available tomorrow or even next week. Take your time to research and don’t be bullied into making a rash decision that you may later regret. The person says there’s no need for a second opinion and discourages you from talking to your spouse, family, and friends. Don’t fall for this false concern. When considering an investment, it is always wise to consider advice from people you know and trust. Scammers like to use social proof to push you to buy now. They may tell you that “everybody” is buying what they’re selling. Whether it’s true or not is irrelevant. What’s a good investment for another person may not be a good fit for you. Instead, focus on why you are interested and how the opportunity could potentially benefit you. The person tries to use reciprocity to get you to buy. Reciprocity in a sales situation happens when somebody gives you a gift or does you a favor expecting something in return. This happens all the time in normal business transactions. A company wines and dines a potential client. The client then decides to do business with the company. 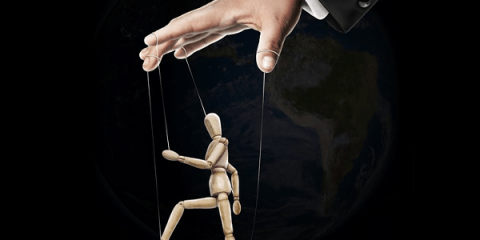 The use of reciprocity by itself does not mean that you’re being scammed. But when reciprocity is combined with the other red flags above, then there is a higher chance you’re dealing with a shady character. Just remember: If the person does you a favor — especially an unsolicited one — that does not mean you are obligated to invest. Scammers like to talk about complex and proprietary investing techniques they’ve developed that allow them to “game the system” and achieve results that are far above average. While the idea of gaming the system may get you excited, remember that complexity is often used to distract, confuse, and conceal fraudulent investments. Furthermore, it’s usually best to invest in things that you can understand. Worse than complexity is when the person either is unable or unwilling to explain the opportunity to you, including any potential risks. This is a big red flag. Legitimate professionals should be able to clearly explain how an investment opportunity works. They should also be willing and able to describe the risks and potential losses. If you are dealing with a fraudster, he is going to want to limit your account control for as long as possible so you can’t access your account or see what’s happening with it. You’ll want to watch carefully for unauthorized trades, missing funds, or other anomalies with your account statements. If you see anything odd, address it immediately. Furthermore, you should also be wary if your assets are held directly by an account manager or unknown entity rather than an independent, third-party custodian. Why? Because it is much easier to scam an investor when the “manager” or “advisor” has direct control of the investor’s assets. But when your assets are held by a third-party custodian, it is much harder (if not impossible) to pull off a scam. Furthermore, there are very few connections or opportunities that are truly “exclusive.” So don’t take their word for it. Always do your own due diligence to verify claims, especially those that raise your skepticism. Overseas opportunities may sound exotic and appealing, but they may actually be far riskier than U.S. opportunities for one big reason: overseas firms and investment managers may not be accountable to U.S. law. If they mismanage your assets or outright steal them, what recourse will you have? Very little, if any. And it’s not just overseas opportunities you need to worry about. For the same reasons above, you will also want to find out if your investment manager is based in the U.S. or in a foreign country. Last but not least, you’ll want to find out where your assets are being held. It is possible to have an investment manager inside the U.S. who then moves your money into an offshore account. If this happens, there could be illegal activity happening. Not to mention, even if it’s totally legal, it could make it much harder to locate and access your money. To reduce your risk, stick to domestic opportunities with U.S. investment managers who use U.S.-based custodian accounts. This will provide you with a certain level of transparency and the full protection of U.S. law. 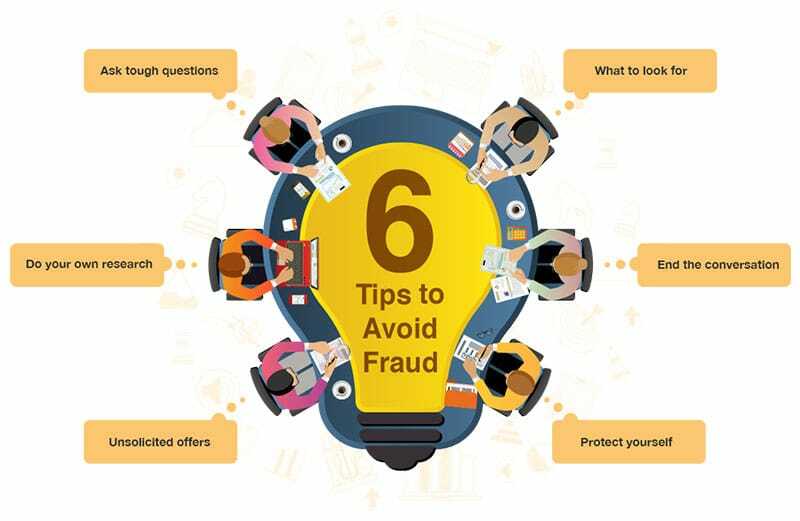 Given that fraud and financial scams are proliferating faster than they ever have, here are a few important tips to avoid becoming a victim. First, get to know who you’re dealing with. Does he seem trustworthy? Or does he strike you as being evasive and shifty? Trust your gut. If you feel like you’re being taken advantage of, listen to that feeling and do not move forward. If the person evades your questions, redirects the conversation, or otherwise tries to deflect, then beware! Never blindly accept what a salesperson tells you. After all, they have a financial interest in getting you to invest. In addition to doing your own research, it’s also good to seek second opinions from family, friends, and trusted financial professionals. Have you ever gotten an unsolicited offer about an investment opportunity? These may show up in your email or mailbox. They may also show up as a phone call. Either way, unsolicited offers are, by their nature, riskier than offers you have found and sought out yourself. If for some reason you are interested in an unsolicited offer, then make sure to do extra due diligence. You’ll also want to make sure that you can find information about the opportunity from independent sources. Due to the low cost and the ability to remain anonymous, the Internet is a breeding ground for fraudulent activity. So think twice about links you click, the emails you reply to, and the information you share. Because on the other end there could be a scammer. 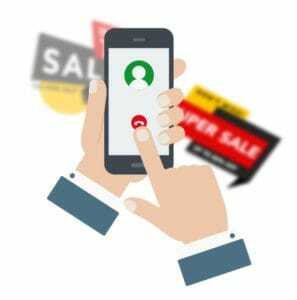 While not a guarantee of legitimacy, you will still want to look for trust seals on the company’s website (like those from the BBB or other consumer protection organizations). You may also want to look for the company’s customer support information and call them prior to handing over any personal information. On social media, you may want to make your account private so that strangers can’t see any updates or photos that you’ve posted. Having private social media accounts makes it more difficult for scammers to take advantage of you. Scammers and fraudsters will often use high-pressure closing tactics to get you to invest immediately instead of taking time to research and think about your decision. It’s extremely important in these situations to not let yourself be bullied. Refuse to rush to a decision even if pushed. And if they start asking you how much credit you have available on your credit cards, end the conservation immediately and get out of there. 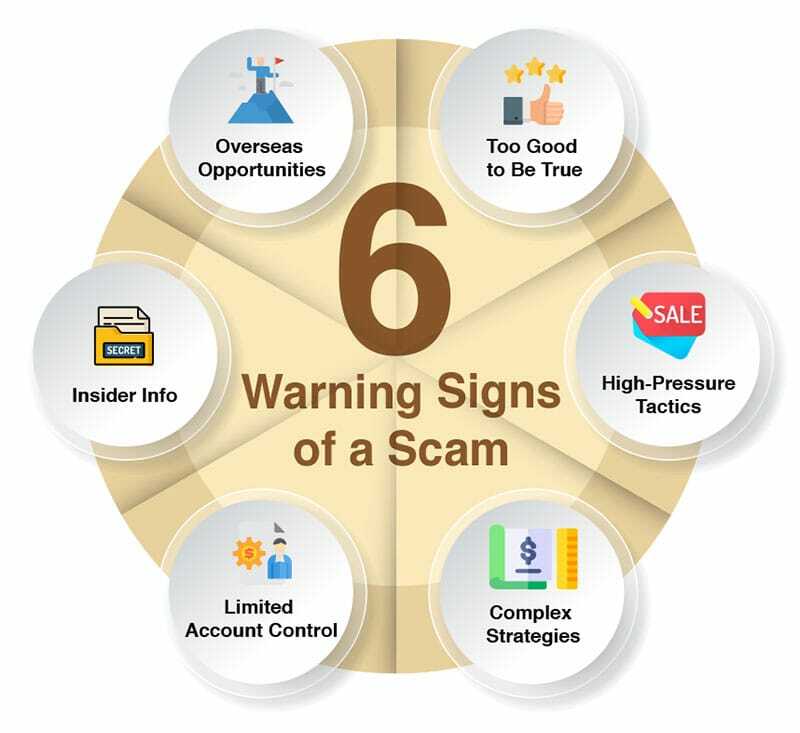 Finally, it’s critical that you become familiar with specific types of scams so that you can quickly identify them when you encounter them. With that in mind, in the next section below, we’ve put together a list of the most common types of fraud in the next section. 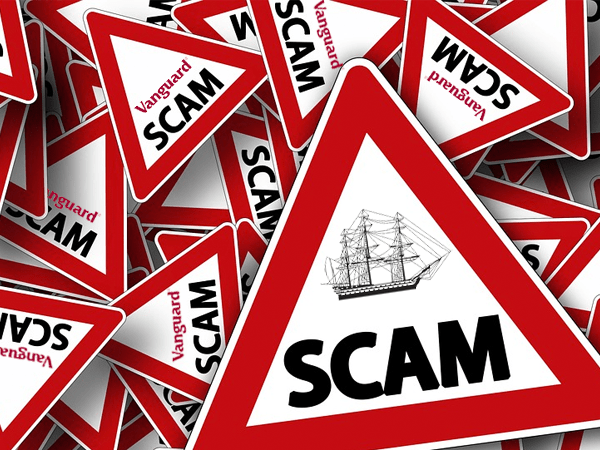 First, we’ll take a look at four types of common scams that never seem to go out of style. Then we’ll look at five types of specific investment schemes that are not quite as common and are, therefore, more difficult to spot. Pyramid schemes are fairly common in the U.S. They often masquerade as legitimate multi-level marketing opportunities, but there’s one thing that makes pyramid schemes unique: they depend on a constant influx of new recruits rather than on the sale of products or investments. There are two problems with pyramid schemes. First, you quickly run out of people to recruit. Second, most people in a pyramid scheme make little or nothing. At Fortune Hi-Tech Marketing, sign-up fees for new recruits ranged from $99 to $299. But according to a 2010 report, 95% of representatives made less than $258 a month, with 29% making nothing at all. Fortune Hi-Tech Marketing reached a settlement in 2014 and no longer exists. Unfortunately, more than 160,000 people were duped during the 13 years that it operated. 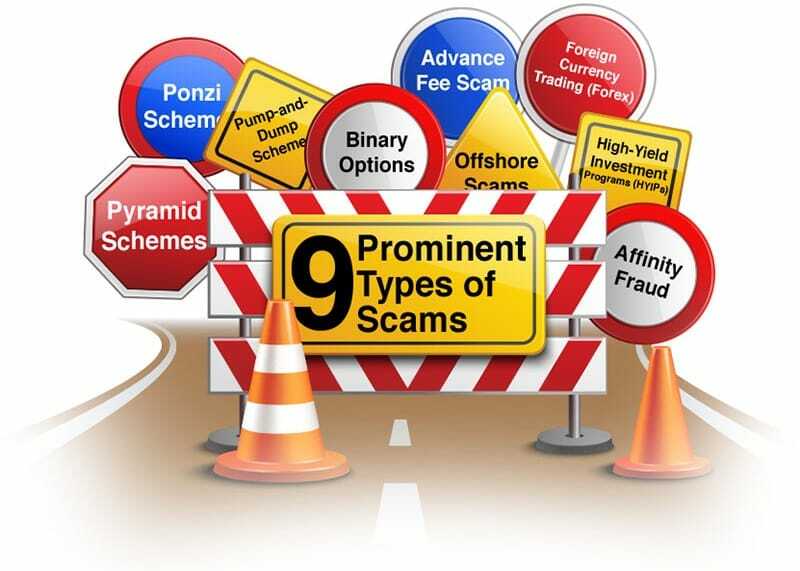 Ponzi schemes are similar to pyramid schemes with a couple of big differences. First, Ponzi scheme operators will promise extraordinary returns in a short amount of time. Then, to make the numbers work, the operators will solicit new investors and use their money to pay back earlier investors. This provides the illusion that the imaginary investment is as profitable as promised. But it only works as long as the amount of money being brought in from new investors exceeds that of the money put in by earlier investors. Naturally, all Ponzi schemes eventually fail, even if they remain operational for many years. 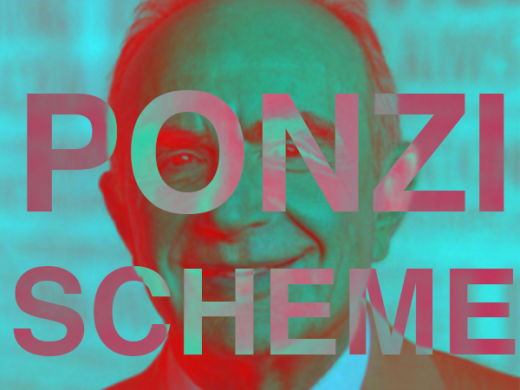 The most well-known examples of Ponzi schemes were those run by Charles Ponzi, from which the scheme gets its name, and Bernie Madoff, who is credited with running the largest Ponzi scheme in history. Ponzi infamously promised returns of 50% in 45 days while Madoff sent his investors fake statements to make it appear as if their money was growing rapidly. The whole thing fell apart when the market crashed and investors started to pull their money out. Madoff could not fulfill the requests and was finally exposed. The scammers will create a compelling marketing piece to pump up the share value of a penny stock they already own. They will then send that marketing piece to tens of thousands of known stock traders and investors. If the piece is persuasive enough, hundreds if not thousands of people will rush to buy up shares of the stock that was promoted. Penny stocks are highly illiquid so it doesn’t take much buyer demand to drive the price up by 100% or more. A few days after the marketing piece hits, the scammers will then dump all the shares they own at a huge profit, leaving all the victims to fend for themselves and absorb the losses. Belfort cheated victims out of an estimated $200 million and was ultimately indicted for securities fraud and money laundering. Stock ticker symbol repeated on nearly every page. Claims of insider info that will soon be picked up by the mainstream news. Rumors about new patented technology that nobody else has. Urgency to get in now before everybody else. Rumors that the company is going to be purchased by a well-known company like Amazon, Apple, or Microsoft. 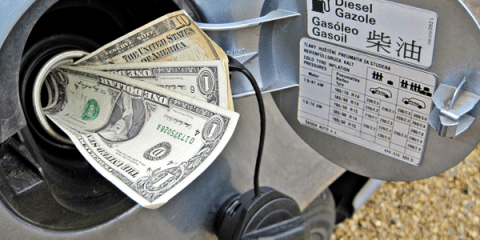 The advance fee scam is extremely common. It’s a fairly simple scam that relies on people’s greed and desire to get rich quick. If you’ve ever received an email from a “Nigerian prince” who says he needs your help to transfer millions of dollars to the U.S., then you’ve already seen an advance fee scam firsthand. Usually, an advance fee scam will promise you a massive return on investment for just a small fee or deposit. For example, the Nigerian fee scam will typically ask you for your bank account information in order to transfer a large sum of money. In other cases, the scammer may ask you to send a small fee to cover the expense of transferring the money to you. If you provide your bank account information, they will steal money from your account. If you send the fee, they will take your money and you will never hear from them again. Perpetrators of advance fee scams often target investors who’ve recently suffered large losses. They may promise to help you recover your losses for a small fee paid in advance. Of course, if you pay the fee, you will lose that too. The foreign exchange market (or Forex, for short) is a market in which you can trade currencies and attempt to make a profit as the values of currencies go up and down relative to each other. While the Forex market is completely legitimate on its own, scammers often pitch investment opportunities and Forex training programs that promise unrealistic returns in short periods of time. 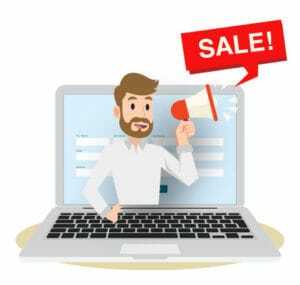 These offers are pitched online, but are also often pitched at free seminars where social proof and scarcity can be used to get victims to cough up thousands of dollars. 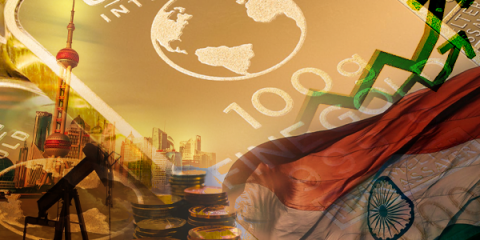 The reality is, the Forex market is dominated by highly sophisticated trading firms. It is unreasonable to believe that individual traders can consistently beat the market with only a little bit of training. Yet greed blinds potential victims because they want to believe in their own ability and the promised riches they hope to enjoy. Sadly, many people who get involved in these Forex “opportunities” fail to understand the risks, so they end up losing a lot of money. While less common, there are some illegal Forex operations that may ask you to send money to an offshore account to be invested by “professionals.” In this case, it is almost assured you will lose every last dollar you transfer. A few years ago, multiple companies were pitching the Iraqi dinar as a legitimate currency investment. People would wire thousands of dollars to these companies and receive physical Iraqi dinar through the mail. Victims were told that once the dinar “revalued,” they would make millions of dollars in profit. Of course, that never happened. 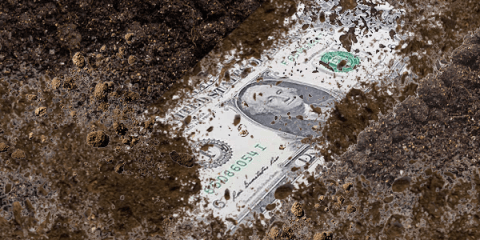 Since the heyday of the Iraqi dinar scam, most of the companies have been shut down, and many of the companies’ owners have been convicted of fraud and are now serving jail time. Affinity fraud capitalizes on identifiable groups of people who have shared values, shared associations, or shared demographics. Scammers who target the elderly are using affinity fraud. They may try to befriend one or more vulnerable elderly people, gain their trust, and then carry out an elaborate ongoing deception, which may include forging checks, gaining access to their bank accounts, or even changing their wills. Other forms of affinity fraud may target members of a church or religious organization. By gaining the trust of the pastor or leader, they may even get him to endorse the fraud to the entire congregation. Affinity fraud refers to how a scammer gains access to his victims. The fraud itself can then take many forms: promotion of a pyramid scheme, forgery, or even outright theft. Example: James Paul Lewis Jr.
Lewis Jr. used affinity fraud to push a pyramid scheme on his unsuspecting victims for more than 20 years. During that time, he stole or lost an estimated $311 million. Offshore scams all have one common feature: the scammer will ask you to send money to an offshore account in Panama, the Cayman Islands, Switzerland, or some other exotic location. Scammers do this to avoid detection. That’s because it is easier to hide behind an overseas bank account than it is to hide behind one based in the U.S. They allegedly want you to invest in foreign real estate with above-market returns. They allegedly want you to invest in a new medical device or procedure not yet approved in the U.S. If you notice these red flags in advance, then caveat emptor! You may be dealing with an experienced cheat or conman. Binary options are like traditional stock options with one important difference: you cannot sell the underlying option. Promoters of binary options like to sell you on the idea that it’s easy to make outlandish gains with very little risk. Of course, this is not true at all. 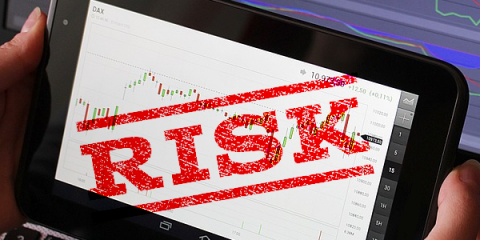 Binary options come with a huge amount of risk, and many people lose a lot of money attempting to profit on them. 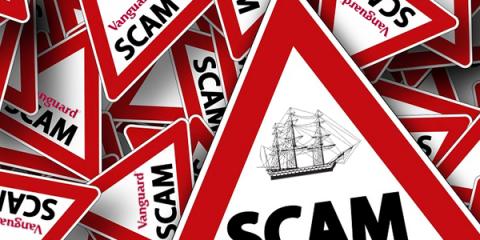 Unfortunately, binary options trading has become a popular area for scammers to operate in. Scams often involve a proprietary piece of software that can allegedly beat the market or hand you consistent wins. In reality, the software may be manipulated to produce a loss. High-Yield Investment Programs promise unusually high rates of return on a daily, weekly, or monthly basis. For example, they may promise 2% a day, 14% a week, or 48% a month. 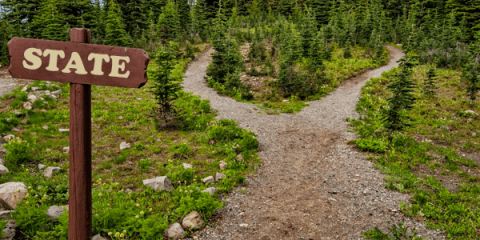 While they may boast about passive income or exclusive investments not available to anybody else, they will often say little about their actual investing methods, choosing instead to focus on their high rates of return. Ultimately, HYIPs are really just Ponzi schemes with a little bit of extra terminology used as camouflage. Those who do receive high-yield payments are really being paid with deposits made by new investors. In the age of advanced technology, scammers are upgrading their methods in order to catch targets off-guard. Check out one of the newest scams, virtual kidnapping, and see how you can avoid being a victim. 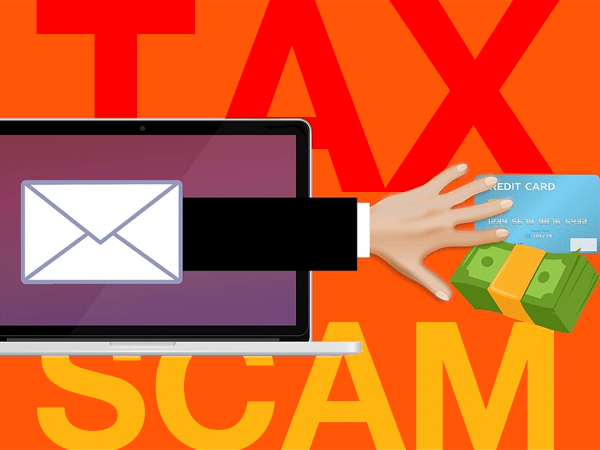 Tax filing season is here, which means so are tax scammers who are ready to get their hands on your money. 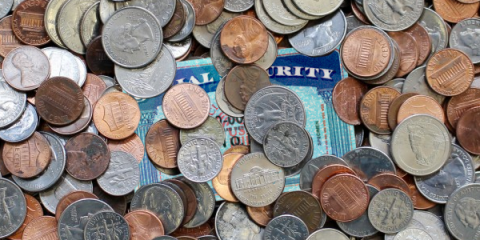 Here are scams to avoid this tax filing season and how to spot them. 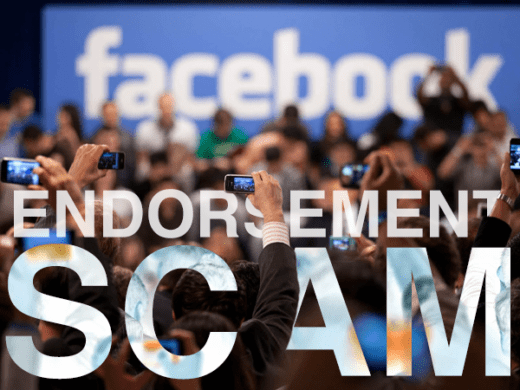 Martin Lewis’ successful legal action against Facebook brought some level of justice for victims of fraud, but perhaps even more importantly, it has brought more public awareness. Read here what scam he exposed, plus learn about the new resource that you can use to help to protect yourself from becoming a victim as well. Woodbridge Group’s massive Ponzi scheme has finally come to an end. See how this “promising investment” swindled over 8,000 investors of their savings and the expensive consequences of this scam. 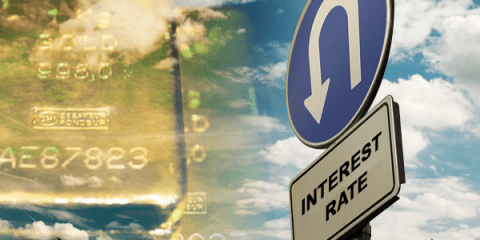 The Federal Reserve shot down market expectations when they announced there will probably be no interest rate hikes this year. 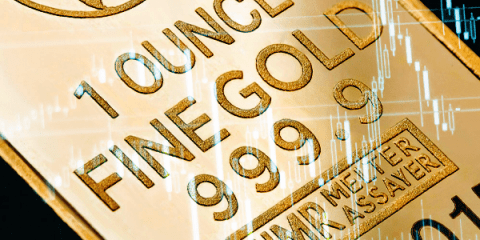 See why this could be highly bullish for gold in this week’s News to Know.